New Optician at Tesco helps to raise awareness of Glaucoma condition. It opened its doors last week with a celebration led by Hastings Mayor, Councillor Nigel Sinden. 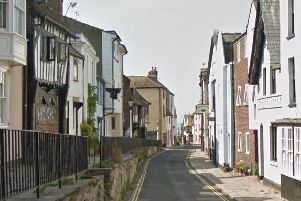 Research indicates a worrying outlook for eye health in Hastings with over 3,000 residents are living with suspected glaucoma, the silent thief of sight. One of the biggest causes of preventable sight loss worldwide, glaucoma is the name given to a group of eye conditions in which the main nerve to the eye (the optic nerve) is damaged. This nerve carries information about what is being seen from the eye to the brain and, as it becomes damaged, vision is lost. An estimated 600,000 people in the UK have glaucoma, yet research indicates half are undiagnosed. Cllr Sinden was guest of honour at the opening of the new ‘Vision Express at Tesco’ store on Church Wood Drive and joined the optical team in encouraging members of the public to prioritise their eye health. “Eye health is a growing issue and I would encourage everyone to have regular eye tests and take their vision seriously,” said Nigel. The Hastings optical store is one of more than 200 ‘Vision Express at Tesco’ outlets launching across the UK in 2018 and showcases a purple-infused rebrand. The re-brand features bright sofas and wooden flooring, offering a modern and vibrant environment. Vision Express CEO Jonathan Lawson added: “This is a hugely exciting time for the Vision Express family, and we’re delighted to welcome new team members to the company and provide a seamless eye health service to former Tesco optical customers.